True Hope and a Future: Invisible? I saw the beginning of a movie called "The League of Extraordinary Gentlemen" last night. It appeared to be an action/adventure movie (think Indiana Jones) and featured the oddest conglomeration of characters I've ever seen assembled: Alan Quatermain, Dorian Gray, Tom Sawyer, Captain Nemo, Dr. Jekyll / Mr. Hyde, and an Invisible Man, among others. 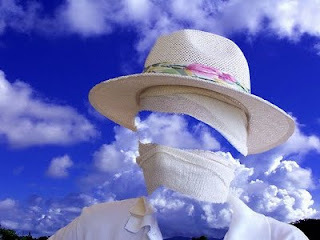 The character of the Invisible Man got me thinking about feeling invisible. Have you ever felt that way, like you're flying under everyone's radar? Have you ever felt like no one listens to what you have to say until someone else says it? Have you worked hard with barely an acknowledgement that you're doing anything? Perhaps your hard work doesn't leave any visible results. You clean the house, do the laundry and cook the meals, only to get up the next morning and clean the house, do the laundry, and cook the meals. Have you ever felt trapped in a never-ending cycle that seems to be leading nowhere? Our society tells us that if we don't have anything to show for our efforts, we must not be doing anything. Our human nature tells us to take matters into our own hands - to let others know that we are doing something. We want to tell everyone exactly what that something is and why it matters. I'm reading a book by John Bevere called "The Bait of Satan." The introduction begins by saying, "Anyone who has trapped animals knows a trap needs one of two things to be successful. It must be hidden, in the hope that an animal will stumble upon it, and it must be baited to lure the animal into the trap's deadly jaws. Satan, the enemy of our souls, incorporates both of these strategies as he lays out his most deceptive and deadly traps. They are both hidden and baited." He goes on to say, "One of [Satan's] most deceptive and insidious kinds of bait is something that [everyone] has encountered - offense. Actually, offense itself is not deadly - if it stays in the trap. But if we pick it up and consume it and feed on it in our hearts, then we have become offended. Offended people produce much fruit, such as hurt, anger, outrage, jealousy, resentment, strife, bitterness, hatred, and envy." What I've read in this book so far has been very eye-opening. It had never occurred to me that being offended is a choice, but now that I am aware of this, I see the opportunity presenting itself with great frequency. I think recognizing this is a good thing. Now I can see the bait for what it is and choose not to pick it up and be offended. However, I'm also seeing areas in my life where I have picked it up. One of these areas is where I'm feeling "invisible." I've taken offense to my efforts going unacknowledged. Sometimes this offense is directed at an individual or group, but sometimes I think it's directed at the world in general. Like that makes sense, being offended by the world! What was even more shocking to me was the realization that I was ultimately offended by God for allowing these circumstances I find myself in. We only need to look at Scripture to see life doesn't take us directly from where we are to where we want to be. God gave Joseph dreams of his family bowing down to him, but he didn't expect to be abused, wrongly accused and imprisoned before ruling over them and all of Egypt. God told Abraham he'd be the father of many nations, but Abraham couldn't have imagined that at age 75, he'd wait another 25 years before the birth of his only child, and then later be asked to sacrifice him. God anointed David as King of Israel, but I'm sure he never dreamed he'd be fleeing for his life before ascending to the throne. The lives of these men help me to make sense of my own life. I did hear God's promise to me correctly; He will make it happen, and all the events that seem to be heading in the wrong direction are all part of His perfect plan. Yesterday someone said something to me, and for a moment I didn't feel invisible. They said they spoke to me because I "happened" to be in the right place at the right time, but I know better. God was sending a message to me, as I'm sure He did to Joseph, Abraham, David, and so many others who've strived to follow Him. He was saying, "I'm here and I'm in control." Really, what more do I need to know? Father, forgive me for the times when I've doubted you. Forgive me for wanting things to go my way and taking offense at what is part of your perfect plan. Open my eyes to offense and help me to refrain from taking the bait. Thank you for making it possible to avoid this trap. Wow, Lisa! This is awesome and you're exactly right!!! I do feel that way a lot of times. I'm going to look into that book, will you hold me accountable in reading it? Just by asking me from time to time? I'm not one to read a book; only my devotional everyday. Thanks for lifting me up today, you don't know how much I needed that. You're a blessing, thank you!